A PHONE call from my good friend Tony Peet got the old grey matter working. We were well into the river close season and he was missing his fishing. Did I have any ideas where we could wet a line and put a bend in our rods? A day’s arm wrestling with Daventry’s Drayton Reser-voir carp in Northamptonshire was discussed and rejected. They might fight hard, but it’s not quite as inspiring as targeting the elusive barbel of the Trent. Not in my book anyway. 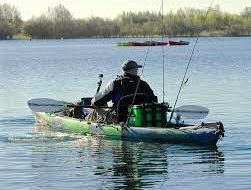 For us there had to be more of a challenge and the subject of fishing at Napton Reservoir soon came to the fore. A few weeks earlier I had fished Napton for the first time in ages. It was during a mild spell in late spring and I thought it was worth a try to see if the venue’s tench population could be persuaded to have a munch. I had been half expecting to blank to be honest, but I could not have been more wrong. In fact, I had a brilliant catch of tench to 5lb plus and some bream to 7lb. I returned two or three times and each time the same thing happened – I bagged up. But what really stood out in my memory was that while I was enjoying great sport, other anglers’ catches were far less spectacular. As the session progressed and the sun got higher, the fish moved into the deeper water and Tony began to catch. 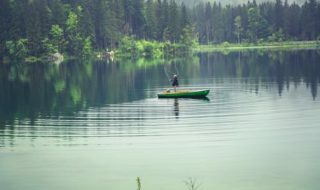 I didn’t put this down to lack of ability or location – the vast majority were fishing boilies as I was – so it had to be down to technique and methods. I had refined a couple of techniques which were definitely producing fish more quickly and the main secret lay in the hook bait and groundbait, more of which later. After a short chat with Tony we agreed to return to put the methods to the test now that the weather was warming up. Would I be able to create a repeat performance for myself and Tony, who had travelled all the way from Lincoln after turning greener than the tench we were after with envy as I recounted my tales of ton-up bags of tench? The day of reckoning soon came round. There is plenty to make the old mouth water at Napton too, and Tony loved the place as soon as he saw it. It’s a 17-acre feeder reservoir for the adjacent Oxford Canal and at the time of writing levels are quite high, but they generally fall significantly through the summer period. The most prominent fish stocked at Napton are the tench but the carp are becoming increasingly popular targets for anglers too and there is plenty more to go at. Napton has produced tench to 8lb, carp to 32lb, roach to nearly 2lb, crucian to 3lb 12oz, perch to 3lb and bream to double figures. Most of you will know that tench are renowned to be good and reliable feeders early in the morning and late evening in particular, but what I had noticed was that my method of fishing could extend this period well into the day. On this particular day we were aiming at a dawn start. The main targets were the tench but I had sneaked a couple of made-up, 21/2lb test curve carp rods into the car so I could get fishing immediately and perhaps winkle out a carp. As soon as we got to the chosen peg on the causeway I put a couple of 16mm boilies on the hair rig at the business end of these carp rods. I added a stringer of freebies and cast out into the dawn mist that was shrouding the reservoir while we prepared the bait and rigs for what would hopefully be a memorable day’s tench fishing. For our tenching our set-ups would be a little more refined. I would be using a 13/4lb test curve barbel rod, while Tony opted for a 11/2lb test curve specimen rod. To be honest, there are plenty of rods on the market suitable for the job. You could use strong feeder rods and even purpose-built Method rods. As long as it’s capable of casting a groundbait ball of four to five ounces 45 yards, then it will do just fine. The set-up included small free spool-type reels loaded with 10lb carp-style main line. I like to use a robust main line which can take the punishment of relentless casting and at the moment I’m using ESP main line. The technique I had had so much success with incorporated one of the Fox inline Method feeders with anchor tubing above it to ensure the line is pinned down behind the feeder. This is important because it eradicates line bites and more importantly stops fish rubbing against the line and spooking. One spooked fish can take a whole shoal away from the baited area. The hook link I have been using is made from Drennan Sinklink in 12lb breaking strain and I use ring swivels to create a presentation that allows the bait to pop up at a 45-degree angle adjacent to the feeder. Hooks are ESP Raptor Short Shank hooks in size 10 attached using a knotless not; otherwise I use palomar knots which have never let me down. I had ready-tied several such rigs before the session and stored them in a rig wallet ready for when required. Reliable rigs are all well and good but at the end of the day I believe that it’s bait that makes all of the difference. The brand of groundbait I have been having a lot of success with is the Halibut Method Mix from Quality Baits, also known as Force Baits. This is a fine, dark mix which contains plenty of oil and I believe this oil seeping off draws the fish in to investigate. The reason I prefer a dark mix is simple. The water at Napton is very clear most of the time and I believe that the fish do not like to be seen over a light-coloured groundbait as they could easily be seen or spotted by predators. The same theory applies to any clear water whether you are after big fish or are pleasure or match fishing. Ashley’s fishing partner Tony Peet with a fine Napton tench which fell to the pop-up boilie technique. The only thing I add to my Method mix is some crushed hempseed, which darkens the mix further and adds activity, plus pellet. In terms of ratios, for every kilo of the Halibut Method Mix I will add half a kilo of crushed hemp, a quarter of a kilo of Green Stimm 3mm pellet and a quarter of a kilo of Halibut 5mm pellet. All the ingredients come from the Force Baits stable. It seems to me that once anglers start feeding high-protein baits, the tench switch onto them as fast as any species, often to the point where you can no longer catch them on methods which once produced excellent results. The groundbait is one half of the winning concoction and you will notice that I don’t feed any large particles. Effectively, the groundbait is being used to draw the fish in to its fishmeal scent but the only decent meal on offer is the hook bait. 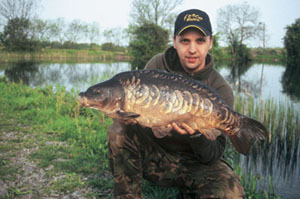 The hook baits I have been using are 8mm Strawberry pop-ups and 10mm Frankfurter pop-up boilies from Force Baits. These can be fished individually or as a double offering but what I have found from trial and error is that pop-up baits far outfish any bottom baits. It must be due to the visibility factor and the fact that the pop-ups are the most prominent offering to fish feeding on the groundbait. My old sparring partner Tony and I had just about finished setting up our tench gear when one of my carp rod buzzers started screaming at me. Suddenly (and I must admit somewhat unexpectedly) I found myself bent into a serious carp which ran straight towards us. Before I knew it, Tony was scooping up a superb-looking mirror carp which sported lovely big scales on its flank and knocked the weight scales round to 20lb. I think they call that a good start and it was to get better. The 20lb carp was quickly photographed and returned before we got down to the serious business of catching tench. 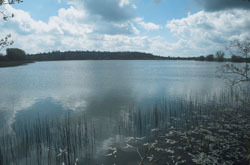 The swim we were fishing was on the peninsula that splits the reservoir into two and is known as the causeway. We fished the bank that faces the bigger part of the reservoir. This swim allowed us both to have a nice, easy 45yd cast to a reed bed. Past visits had shown me that the edge of the reed bed gave us about three feet of water, falling down to six feet. The intention was to start the session close to the reed bed when light values were low, but these swims gave us the option of moving to the deeper water as the sun got higher in the sky, which often forces the fish to back off from the margins. We hadn’t pre-baited and, indeed, I’ve found it better not to put any feed out before starting. It’s better to gradually build the swim and pick off fish as they move in, rather than have too many in the swim at one time. The idea is to keep casting and, thus, feeding the swim with the groundbait around the Method feeder. We were fishing two rods each and the longest we would leave any one rod without casting was 20 minutes. I was fishing in a slightly shallower area than Tony, just off the edge of the reed bed. The bait was a double, popped-up 8mm strawberry boilie fished on a hooklength of no more than four inches so it popped up directly above the Method feeder. Rather than just attaching the hooklength to the swivel you push into the Method feeder, I incorporate a size 9 ESP ring swivel and the hooklength is attached to this. This gives the hook bait plenty of movement and I have found it very effective in terms of its self-hooking properties. Incidentally, I have seen many times that some anglers push the hook bait into the ball of groundbait. I never do this, as I want it to be above the ball immediately and this has proven to be effective. Many’s the time I have had a take almost as soon as the hook bait has hit the bottom. After a quiet half an hour I started to get takes, resulting in a string of nice-looking tench mainly in the 3lb to 4lb bracket, which is typical of the fish you can expect at Napton. A carp angler’s warning that this peg is ‘tenchville’ (inset) is music to Ashley’s ears. In fact, my part of the swim was producing the majority of the action – so much so that Tony soon started accusing me of keeping the real secret to my Napton success to myself. I knew he was winding me up. I’d told him everything but I went along with what he said and reassured him to persist and recast every 15 minutes even if a bite did not materialise. 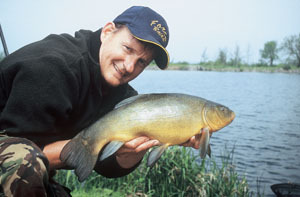 I knew from experience that this was how to bring the tench into the swim. As long as the feeder kept landing in the same spot, the fish would be in Tony’s swim soon enough. I cannot stress greater how important accuracy is, as what I have found at Napton is that once the swims begin to develop, the sport just gets better and better as long as the bait keeps going into the same spot. Sure enough, after about another 20 minutes Tony began to get the 3lb to 4lb fish and soon we were catching fish-for-fish. It was nothing to do with who was fishing one bit of the swim or another. It was all down to the bait going in and keeping things accurate. We were both using Fox carp hangers for bite registration. 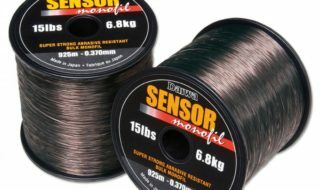 I use a medium weight setting and set the rods pointing down at the water to ensure the line and tubing are laying on the bottom of the reservoir to prevent line bites. The bites you get at Napton seem to develop in one of two ways – the hanger rises slightly then falls, giving lots of slack line as the fish swims towards you, or the bobbin rises and doesn’t stop as the fish tears off, necessitating the use of the Baitrunner reels. In both cases the fish has already hooked itself and is on. Not a bad start to the session for Ashley – a 20lb Napton Reservoir mirror carp. The action became so hectic that on quite a few occasions we had bites as we set the bobbins up after casting in. On several occasions we would both be on our feet playing fish simultaneously. The action was brilliant but the only problem that developed as the morning progressed was that the fish were not getting any bigger. My previous visits had yielded fish up to 5lb, whereas this time we could not get a fish bigger than 4lb. However, it’s hard to complain when you are bagging up on tench on a crystal-clear reservoir like Napton. We were soon onto our third mix of groundbait. We had brought three kilos of Method mix, a kilo of crushed hempseed and a kilo of micro trout pieces. When putting this mix together it’s important to only add a little water at a time. Too much water and the mix becomes too stodgy and can still be stuck to the feeder when you reel in. Too little water and the mix will probably not survive the cast and will disintegrate. By mid-morning things had slowed right down for me and now Tony was enjoying all the fun. He had built his swim up slightly further from the reed bed in the deeper water. With the light values having increased, the tench had vacated the shallows. At 11am Tony had what we in the trade call a ‘screamer’ of a bite. He clearly had a good fish on and after some drama, when the fish tried to charge through some marginal reeds, he scooped the net under the day’s best tench at 5lb 10oz. It was not a monster by national standards but, when the venue’s best is around 8lb, that’s a smashing fish. After that things went quiet for both of us and we decided to call it a day. We pulled in our keepnets and consolidated our catch. 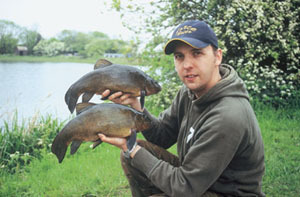 The total was 33 tench for 115lb. Tony made the comment that he had never seen so many perfectly-conditioned tench in his life. As an individual, at Napton I don’t normally use a keepnet but that’s an average catch at this £5-a-day fishery when you do things right. Tench fishing using a 10lb main line and a short, 12lb braided hook link of about three inches may be viewed as crude by some but we never lost a fish from tackle breakage or in a weed bed. Of course, I still enjoy catching fish on the float or groundbait feeder but, for sheer numbers of fish, the Method certainly takes some beating. Ashley sees no need to bury the hook bait in the Method feeder ball, as he wants the bait above the feeder the moment it lands. He has found that takes can come the moment the feeder hits the bottom as fish home in on the groundbait. To accentuate this he likes to use PVA foam on the hook. The PVA dissolves and is off the hook in a matter of a couple of seconds. “There is no doubt about it, my tests have shown that a popped up bait far outfishes a bottom bait. It’s just as clear that you should not put large hook bait samples into the mix. Give the fish one decent-sized meal to aim at – that’s the one on your hook,” says Ashley. You need Fox inline Method Feeder, 10lb mono, Anchor Rig Tubing, size 10 Raptor hooks, ESP ring swivels size 9 and 12lb braid. First of all, tie a small loop in the end of a short length of 12lb braid. A knot picker will help you close the loop down. The next step is to mount two 8mm pop-up boilies onto a baiting needle and take hold of the loop of the hair. Carefully, pull the braid through the bait using the needle and secure it using the hair stop of your choice. Now for the knotless knot. Start by threading a size 10 hook onto the braid from the back of the hook’s eye. Position the bait so that the top boilie sits just below the bend of the hook. Start whipping down the shank. Make about eight whips down the shank and, holding the whip tight to it, thread the other end through the back of the eye again. The final step is to tighten up the knot and push the knot to the top of the hook. One knotless-knot hair rig. The next step is to attach the other end of the hooklength to the ring of the size 9 ring swivel with a palomar knot. Trim the knot back. Thread the main line through the ESP rig tubing. It can help to cut the mono at an angle to create a point. If you are using braided hooklengths but don’t have any braid scissors with you to trim back any excess, borrow a lighter and the problem is solved. Ashley always uses the palomar knot with braid and says it has never let him down. The hook is attached using the knotless knot, which allows him to choose the length of hair he needs depending on whether he’s fishing one boilie or two. Now thread the main line through the Fox Method feeder and then tie it to the ring swivel. Trim the knot back.Draw the line back through the Method feeder to pull the ring swivel into it. The swivel needs to fit snuggly. Push the swivel into the tubing at the end of the feeder so that it fits securely. Push the rig tubing over the other end. A semi-fixed rig completed. The bait sits directly above the feeder and the ring swivel allows it ease of movement. Use some PVA foam to keep the hook bait clear of weed. 1 Half a kilo of crushed hemp is added to a kilo of Force Baits Halibut Pellet Method Mix. 2 The dry ingredients are mixed together thoroughly before any water is added. 3 Water (preferably from the venue) is added a little at a time and worked in. 4 As you can see, the mix darkens. Mix until you can form a ball like this with one squeeze. 5 A quarter of a kilo of 3mm Green Stimm pellet is added for every kilo of the mix. 6 In goes a quarter of a kilo of Force Baits Halibut 5mm pellet. Mix it in. 7 Large hook samples like this are not added. The only large item of food is on the hook. 8 Keep the hook bait clear and mould the groundbait around the feeder and into an egg shape. Next Biggest Pike Of The Season?